Anti spikes consist of two rows of sharp razors or blades. They will provide a continuous barrier to burglars & unwelcome visitors. According to the efficiency and size, our anti climb razor security spikes can be divided into three types - large, medium & small. The larger, the stronger. 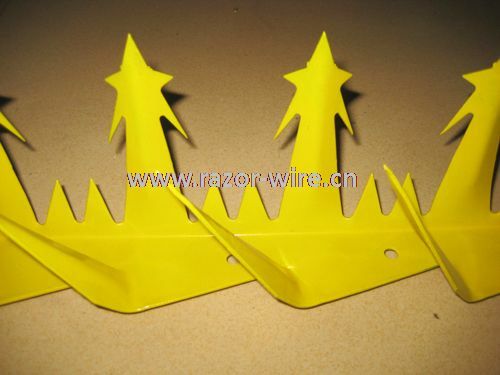 Commonly, large razor spikes are used as toppings of fence gates and other important entrance of perimeter fencing or wall. Anti spikes are dangerous and will cause physical injury. Warning board should be clearly displayed. Free warning signals are provided if you need. In addition, expansion bolt for installation is provided at additional cost.